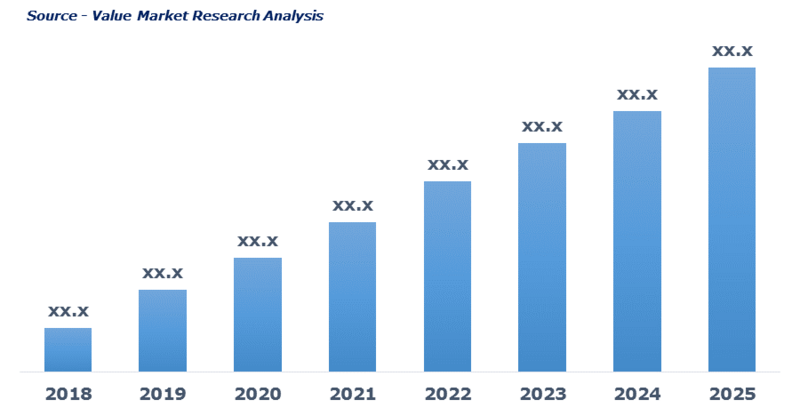 The market of point-of-care diagnostic is expected to gain enormous growth over the forecast period owing to changing preferences of patients towards point-of-care and a home-based device that are efficient, advance, and give the immediate result. Also, the rising prevalence of disease like diabetes, cancer, cardiovascular condition and other chronic diseases along with the growing need for rapid diagnosis and treatment is further expected to raise the demand for these products. Growing government support in the forms of funds and favorable regulations that aimed at promoting point-of-care device is also anticipated to enhance the market growth. As per the latest report added by Value Market Research, the Global Point Of Care Diagnostics Market was valued USD 27.4 BN (by revenue) in 2018 and is anticipated to reach USD 52.6 BN by 2025 with a CAGR of 9.75%. Glucose monitoring kits are highly preferred by diabetic patients as periodic monitoring of glucose level is very important for them, which has raised the adoption of these POC devices. Also, the segment growth can be attributed to the advantage associated with devices such as portability and easy to use, thereby fueling their demand. Prescription based testing kits are gaining traction in the market owing to the rising prevalence of various chronic disease like cancer, diabetes, and other infectious diseases. Also, rising demand from healthcare facilities as this device is frequently used across healthcare centers and are mainly prescribed by professionals is also expected to propel the segment growth. Hospital segment is dominating the segment and is likely to maintain its dominance over the forecast period. This can be attributed to improving healthcare infrastructure coupled with the rising government investment in order to promote this device is further expected to augment the segment growth. Favorable government norms for the development of such devices along with the well-established healthcare infrastructure is propelling the market growth in North America. The rapid adoption of technically advanced testing kits and high awareness level among patients as well as a physician is also expected to enhance the market presence in this region. Abbott Laboratories, Alere Inc., Becton, Dickinson and Company, Dnaher, F. Hoffmann-La Roche AG, Instrumentation Laboratory, Johnson & Johnson, Nova Biomedical, Omron healthcare co., ltd., and Siemens Healthcare GmbH. As per this study the Global Point Of Care Diagnostics Market was valued USD 27.4 BN (by revenue) in 2018 and is anticipated to reach USD 52.6 BN by 2025 with a CAGR of 9.75%. The point of care (POC) diagnostics are the medical devices used to get an immediate result in the investigation of various diseases such as diabetes, cancer, cardiac diseases, and other ch0rnic. Point of care diagnosis offer early detection of diseases and can greatly impact the medical result of the treatment. Lateral flow, biosensors, agglutination assays, and solid phase, are some of the technologies used in point of care device which is all advanced and unique for specific conditions.